Qatar Happening, October 2016. Original article. If you look closely, cities are full of poetry. We went on a search for random and obscure poetic attractions and found plenty to love in New York, London, San Francisco – and also in Seattle, but only in the rain. For a visitor, sights that only show up when they feel like it can be frustrating when you’re on a schedule. In New York, anyone can go look at the Statue of Liberty, but if you wanted to see the larger-than-life art of Jenny Holzer at the Guggenheim, you had to be there at the right moment in 2008. That’s when it was projected across the entire front of the museum: “More people and new offenses have sprung up beside the old ones – real, make-believe, short-lived.” For a moment, Holzer’s bold poetry prompted New Yorkers to stop in their tracks. Temporary sights are often all the more magical: you’ve seen something that was only there for a brief moment. The permanent attractions are there for anyone, but these subtle, poetic installations are often the purview of locals. Created by artists, they’re placed not in galleries but where people might not expect to come across them, rendering them all the more powerful. Like four years ago, when visitors to London’s Shoreditch area could briefly spot the poetic art of Robert Montgomery out in the wild. You could be walking along the street, and suddenly be faced with giant posters with the artist’s poetic musings: “This city is wilder than you think, and kinder than you think. It is a valley and you are a horse in it. It is a house and you are a child in it. Safe and warm here, in the fire of each other.” Read on a giant billboard, it stayed with you all day. In part because we don’t expect to find it, street poetry will often feel hard-hitting. Last year, locals and visitors in Seattle were treated to what was literally a rainy day project: local magician Peregrine Church adorned the city’s pavements with words that can only be seen when it rains. “Rainworks” used biodegradable, water-repellent spray to stencil poems onto the concrete pavement, rendering the letters dry when it rained and hence readable. “Worry is a misuse of the imagination,” declared the wet pavement, cheerily. Each poem wears off after about six weeks, but “Rainworks” sells kits to anyone who wants to create their own rain poetry – meaning they could pop up everywhere. In New York, there’s a fantastic piece of city poetry that you can still catch, if you’re quick. It’s painted across the entirety of a Brooklyn parking garage, courtesy of Steve Powers. “EUPHORIA IS YOU FOR ME,” the garage boldly declares, in what has become known as a love letter to the borough. 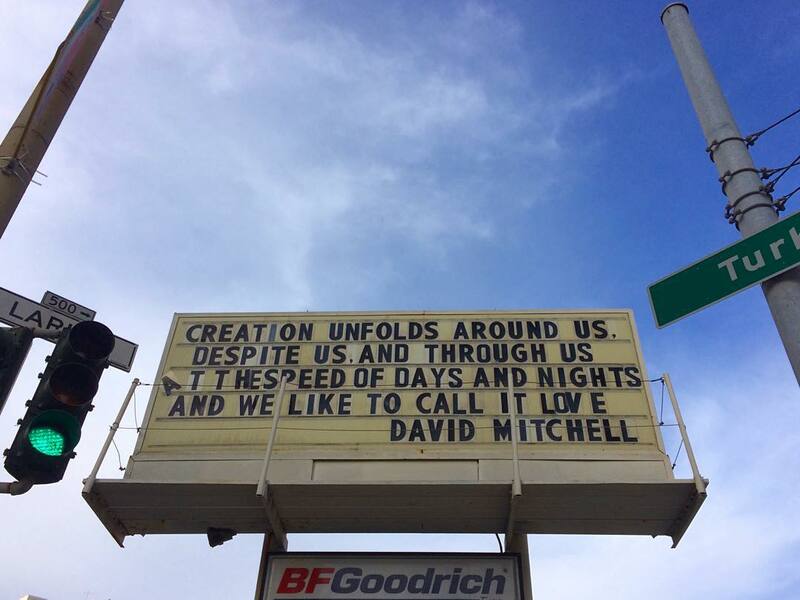 Earlier this year, the garage’s owner announced it will be torn down, causing an outcry among people who’ve come to love the upbeat poetry that you can’t help but read every time you pass it. The black and white text wraps around the entire building, creating what the artist calls a “block-long poem”. The garage is still standing, but don’t wait too long: by the spring the building, and the poem too, will be rubble. Posted on 10/02/2016 by Jess. This entry was posted in Travel writing and tagged city poetry, qatar happening, travel. Bookmark the permalink.